Our Personalized Glass Coaster Wedding Favors make a wonderful gift for any theme! Offering hundreds of design options, you're sure to have fun creating the perfect style for your next event. We use silkscreen technology to ensure a high quality of accuracy during the personalization process. Each coaster is 3.5" square and are equipped with rubber feet so they won't slip. Brides tell us this was "a great gift to give that wasn't cheesy, but also had a personal touch." They describe this as "sturdy" and "is still going strong a year later". Other brides paired this with cork magnets, wine bottle stoppers or personalized napkins. Also great for anniversaries because "We were able to put a unique message on there showing our love after 50 years". Brides tell us "even with the fee, and shipping costs (because these are heavy) these are a great value for the money". Other buyers said "Guests thought we put a lot of effort into this" but "it was super easy to setup and was sent to us pretty quickly, even though it was personalized." This is the Personalized Glass Coaster Wedding Favor by FashionCraft. You can see that it can be personalized with any design that you want. And the inscription on the bottom with the date of the party or event, wedding that you are hoping your guests will remember. This glass here, I'm trying to let you see how durable that is. And the inscription, I'm scratching it. You can see that the inscription is raised, and it's not gonna come off. Very high quality product and one of our best-selling items. Yes, you can personalize this item and a name or date. You can add 2 text lines with a maximum of 22 characters on each line. The wedding coasters that I am ordering which is 167 of them and the total price is 106.88 does that include everything such as our names and wedding date? We make each one of these Personalized Glass Coaster Wedding Favors by hand, there is a $45 setup fee and that’s the only additional cost. The cost of personalization is embedded in the price and part of the setup fee. Can i personalize the message on the favors? Yes, you can personalize this Personalized Glass Coaster Wedding Favor and you can do that after adding it to your shopping cart. I need to know if the coasters will have boxes included? You will need to pay extra $0.35 to have it gift boxed and you can specify that after adding this Personalized Glass Coaster Wedding Favor in your shopping cart. I'm interested in the personalized coasters, but I have a logo I'd like to use instead of your premade wedding designs. Only the design options listed on our site are available. I'm sorry, we're not able to accept other images, photos or logos for these Personalized Glass Coaster Wedding Favors. Are boxes provided for the Coasters? You can include a gift box for this Personalized Glass Coaster Wedding Favors for an extra fee of $0.35. Can you upload your own graphic on personalized coasters? I was wondering if I could make a copy/paste of the sample of the coaster that I'm interested in? For sample orders, you will not be able to specify personalization. Your item will consist of a random representative sample. A minimum quantity of 40 coasters is required to add your own personalization of the Personalized Glass Coaster Wedding Favors. I would like to see if i can order some sample that I can use with the couple pictures? Yes, you can purchase a sample of this Personalized Glass Coaster Wedding Favor at a special price of $0.49 so you can check if it works for you. How are these coasters packaged? These Personalized Glass Coaster Wedding Favors are bulk packed. Each coaster is 3.5" square and are equipped with rubber feet so they won't slip. Hello can I personalize this with my own design or does it have to be your design? I'm sorry, only the designs listed in our product page are available. We don't accept other image or logo for this Personalized Glass Coaster Wedding Favor. Are the white boxes included for the each coaster or are they extra charge? The gift boxes are seperate/additional fee of $0.35 each and it is 1 per item when you order these Personalized Glass Coaster Wedding Favors so if you order 30 coasters and add gift boxes you will receive 30 gift boxes. I am interested in a custom glass coaster with purple writing. Is there a cost to upload an image? You need to pay extra extra $45.00 to customize this Personalized Glass Coaster Wedding Favor and you can only select a design from the options we have in our designer tool. I want to purchase 150 packs of 4 Personalized Glass Coaster Wedding Favors each. So a total of 600 coasters, but 150 boxes. How can I do this? These coasters are sold individually only; we're not able to change the quantity to sets. My apologies for any inconvenience. Can you personalized a coaster with your own saying? You can add your own text on these Personalized Glass Coaster Wedding Favors as long as it fits within our template, but only the design options listed on our site are available. I'm sorry, we're not able to accept other images, photos or logos. Hello can I put my own design on the personalized glass coasters wedding favor? Hello can I personalize the glass coasters and send my image the to get a quote? Yes, the Personalized Glass Coaster Wedding Favors can be personalized and you can see design using our designer tool after adding it in your shopping cart. Also, we're not able to accept other images, photos or logos. You can only select from the designs listed. I looking to purchase 100 glass coasters for our 40th class reunion, and I'm wondering how many characters and/or lines can be put on it? You can add 3 text lines with a maximum of 22 characters on each line for this Personalized Glass Coaster Wedding Favor. I am looking to purchase 100 glass coasters for our 40th class reunion, and I'm wondering how many characters and/or lines can be put on it? You can add a monogram or 2 text lines and a date underneath maximum of 22 characters. You can also see the information listed towards the bottom of the product description of the Personalized Glass Coaster Wedding Favors. Hi, Is this a set? The Personalized Glass Coaster Wedding Favor is individually sold and bulk packed when delivered. Each coaster is 3.5" square and are equipped with rubber feet so they won't slip. Would i be able to get these coasters in a box but without the bow on the box? 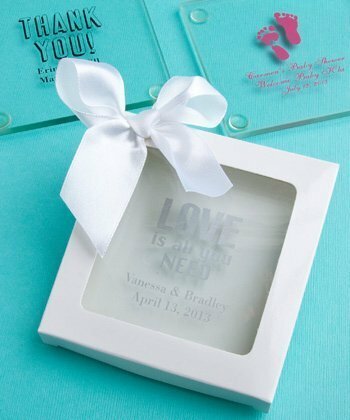 You have an option to add a gift box when you purchase this Personalized Glass Coaster Wedding Favor but the box would really have a white bow on it. Yes Evie you have an option to add a gift for an extra fee of $0.35 each. You can specify that under personalization after adding it to your cart. Is it possible to order just one favor to see it? Yes, you can order a sample of the Personalized Glass Coaster Wedding Favor at a special price of $0.54. Just enter 1 in the quantity box then add to cart and complete the check out. How can I view the design? You can click on the 'Personalize Now' button after adding this Personalized Glass Coaster to your shopping cart. It should bring up your design selections, which is also your preview or "proof" of how the coasters will appear. I'm looking to design a glass coaster and wanted to know if I can upload my own image? Only the design options listed on the Personalized Glass Coaster Wedding Favor page are available. I'm sorry, we're not able to accept other images, photos or logos. You can only select a design from our View Coaster Designer preview/personalization tool that's located in the product description and in the cart. Unfortunately, our customers haven't reviewed this product yet this year. However the Personalized Glass Coaster Wedding Favors are the same as they've been in years past. I wanted to ask if the cost listed for the item includes personalization, or is that extra? The cost for the Personalized Glass Coaster Wedding Favor doesn't include the $45.00 Artwork Setup Charge to personalize this item. There is an additional $0.35 each if you want to add a gift box. Hello, do the coasters come with boxes? 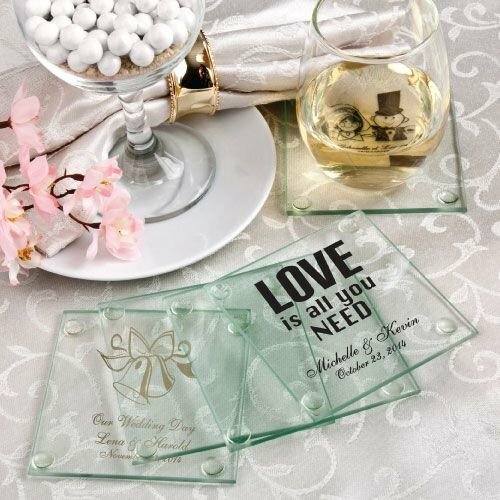 The Personalized Glass Coaster Wedding Favors are bulk shipped without boxes, but you have the option to order gift boxes if you would like them, at an extra fee of $0.35 each. You can add them while entering the personalization info/section. I have 160 guests attending in total and I was wondering if the glass coasters come in Bulk? The Personalized Glass Coaster Wedding Favors are sold individually and packed in bulk. You also have an option to add a gift box for an extra $0.35. If you are expecting 160 guests and you need to order 160 favors, just enter 160 in the quantity box and click add to cart, then continue to the check out. I need this item by Friday June 22th, where do I go to personalized it? I'm sorry, the Personalized Glass Coaster Wedding Favors take 2-3 weeks for processing and shipping. Also, you need to add the items to your shopping cart in order to go to the personalization section. There should be a button that says 'Complete Missing Info' next to 'Personalization', and that's where you personalize your order. How many coasters come in one pack of glass coaster favor? The Personalized Glass Coaster Wedding Favors are sold individually.